Thousands of Territory students returned to the classroom this week with a fantastic start to 2019! A wide range of activities took place in our schools to welcome the new year of learning, with Lajamanu School students enjoying a healthy breakfast so they had a full tummy for lots of learning throughout the day. Ciaran Bailie, Deputy Principal of Lajamanu School, said six teachers have joined the team at Lajamanu and students were excited to show them around the school as they established rapport with each other and built meaningful relationships. “We have been lucky to get a mix of experienced and graduate teachers. The new staff are very enthusiastic and have brought an excited, enthusiastic energy into the classroom,” she said. Lajamanu School have an exciting year ahead with lots of community involvement and the celebration of cultures within the school. 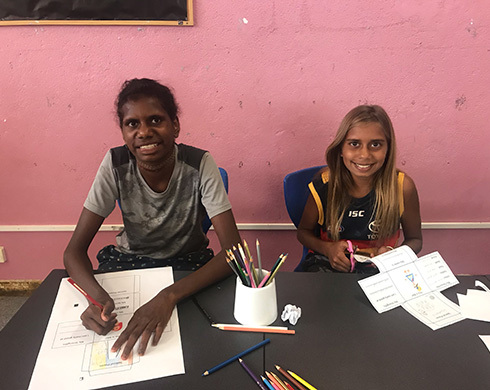 “We are excited to get our Warlpiri program going this year and welcoming Elders and families into the school to be involved in their children’s education,” Ciaran said.